Candidates applying for Head Constable Jobs must not exceed the upper age of 25 years and below 18 years as reckoned on 01-09-2018. 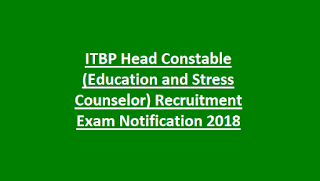 Candidates interested to serve ITBP Force must have passed 12th class from a recognized University/Institute. Dearness Allowance, Ration Money, Special Compensatory Allowance, free uniform, free accommodation or HRA, Transport Allowance, Free leave pass, free medical facilities and other allowances are admissible beside the basic pay. Height Bar Test: The first and foremost test will be Height Bar test and only those candidates will be sent for further screening who meets the minimum height standards. Skill Test: It will consist of typing test on computer and will be qualifying in nature. Verification of Documents & Medical Examination: Candidates qualified in above stages will be asked to produce original documents relevant to the recruitment process so as to verify. Candidates found cleared in verification process will be subjected to detailed Medical Examination thereafter. SC/ST/PWD candidates are exempted from paying an application fee. 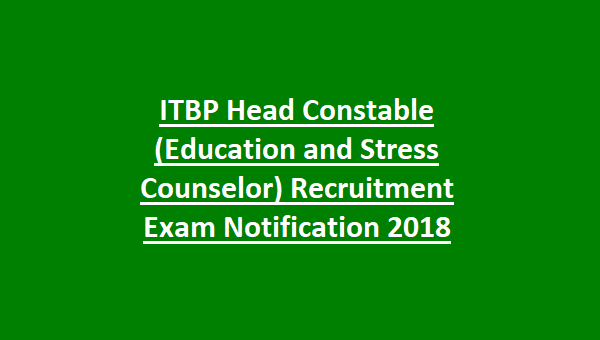 Candidates interested to join ITBP Force as Head Constable must fill the online application form through the official website http://recruitment.itbpolice.nic.in/ on or before 24th October 2018.